Rendering of Hyatt Centric in Los Angeles. A Hyatt Centric is in the works in Los Angeles’ Koreatown marking the brand’s first in the Los Angeles metropolitan market. Breaking ground this summer and set to open in mid-2021, the new Hyatt Centric hotel partners with Large Architecture and Hirsch Bedner Associates (HBA) on its construction and design. 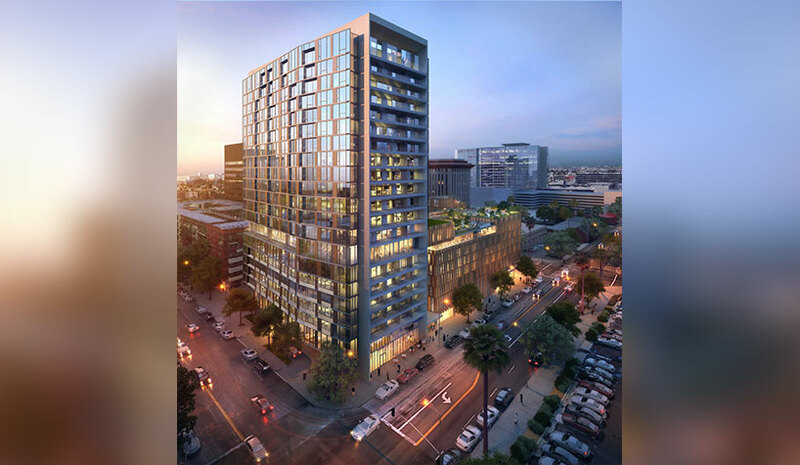 Developed by Leo Lee, the project will come to life in a mixed-use 21-story hotel and residence destination, with 122 condominium units, a 192-room hotel and 14,500 sq. ft. of commercial and retail space on the ground and second floors. The Ben is slated to open by December in West Palm Beach, FL. This marks Autograph Collection’s first hotel in Palm Beach County and joins the Concord Hospitality portfolio as its 17th property in the state of Florida. Located in downtown West Palm Beach, the 208-room property is the centerpiece of Flagler Banyan Sq., a 435,000-sq.-ft. mixed-use lifestyle project developed by local commercial real estate firm Navarro Lowrey Inc. The development will also include residential, dining, retail and other amenities, while The Ben will have a full-service restaurant, rooftop ballroom and a rooftop pool and amenity deck with views of the City Marina, Intracoastal Waterway and Palm Beach Island. Kimpton Hotels & Restaurants will open its first property in Montana; an adaptive reuse scheduled to open in Bozeman, MT early next year. The project will turn the National Guard Armory building into a 122­-room hotel with a signature restaurant, a whiskey and bar-centric speakeasy and 8,000 sq. ft. of meeting and event space. The new Kimpton will also have a concert hall and a rooftop pool and bar. Etxea Hospitality is developing the project. Tom LaTour, Kimpton co-­founder and former CEO, is also a partner on the project. The Brenton Hotel will debut in spring 2020 along the waterfront on the corner of America’s Cup Ave. and Long Wharf, adjacent to the Newport Visitor Information Center and the Newport Marriott Hotel. Owned by LWH LLC and operated by White Horse Hospitality also of Newport, RI, the Brenton Hotel will be a five-story structure with parking on the ground floor and four floors above for public space and 57 guestrooms. The architect for the project is Group One Partners in Boston. Newport-based Behan Brothers are general contractors for the development.